May 23, 2019 is Stop the Bleed® Day in B.C., and Trauma Services BC is marking the day by partnering with Society of Professionals in Emergency Care (SoPEC) and the Emergency Nurses Association of BC (ENABC) to provide a province-wide Stop the Bleed® training blitz. Sign up for the free 1-hour course at a location nearest you. Locations include: Vancouver, Victoria, Elkford, Fernie and Sparwood. What is Stop the Bleed®? Stop the Bleed® is a national awareness campaign and a call to action that aims to train citizens how to stop a person from bleeding to death. Stop the Bleed® was initiated by the American College of Surgeons in 2015 in response to the active shooter disaster at Sandy Hook Elementary School in Newtown, CT. Their goal was to create an initiative that will improve survival of mass casualty events. Unfortunately there are many instances that may cause injuries with massive bleeding, such as a road vehicle accident, recreational event or sport-related injury. For anyone who may be a bystander or first on the scene, having the skills to manage massive bleeding could save a life. 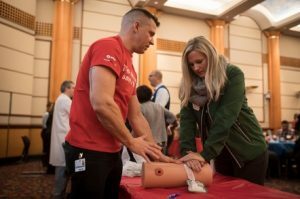 Since 2015, Stop the Bleed® has been adopted internationally to provide basic life-saving skills to health care professionals and members of the public. © 2019 All Right Reserved By STOP THE BLEED®	| Clearex Theme by Xgenous.